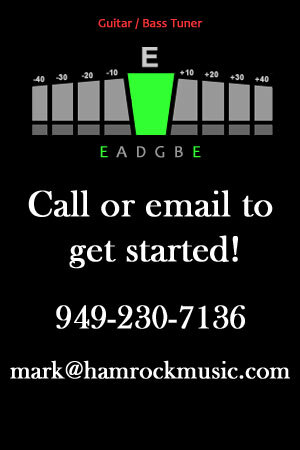 Guitar lessons and bass lessons in Orange County for all ages and levels taught by OC’s premiere professional guitar and bass teacher, Mark Hamrock. Learn any style including rock, blues, jazz, classical, etc. in a professional and private setting. Lesson programs are designed specifically for you based on your current musical skill level, age, and objective, so you reach your goals quickly while having a great time in the process! Check out some of Hamrock Music’s students here. 20 years experience teaching guitar and bass lessons.  Has taught many local guitar and bass teachers in the Orange County area. Studied rock and blues with Rusty Anderson (guitarist for Paul McCartney, Elton John, Willy Nelson, Santana, and more). Studied classical guitar with David Tanenbaum and Scott Tennant. Toured and performed with guitar legends including Larry Carlton, Tim Reynolds (Dave Matthews Band), and Dave Mason with Traffic. Graduated Honors with a Bachelor of Music Performance Degree from the University of California, Irvine. 2 years as Princeton Review instructor. Studied jazz with Alan Rowe (Stan Kenton Orchestra, Keith Jarret). 30+ years experience playing guitar and bass. Studied nine years of classical piano. Guitar Lessons in Orange County Ca taught by professional instructor Mark Hamrock. 15+ years teaching experience. I highly recommend Mark to anyone wishing to learn how to play the guitar or bass. In the four plus years I've been taking guitar lessons he has helped me improve my playing ability and knowledge of music theory dramatically. Mark's background with UCI's classical guitar program and his studies in jazz means he has been able to clearly explain or demonstrate anything I've asked him! I must have met with six or seven instructors from south Orange County, and Mark was one of the last and by far the best.. I credit Mark for not only teaching me the basics of guitar playing, but also demonstrating great passion for blues guitar theory and a deep understanding of what gives that music it's soul. I would recommend Mark to any beginner, intermediate or advanced guitar student and look forward to working with him for many years to come. Mark has greatly accelerated my learning with a combination of music theory and instructed practice to be able to play along with my favorite songs/artists. All of this in less than a year!